This stone commemorates the visit of H.R.H. The Duke of Edinburgh K.G. 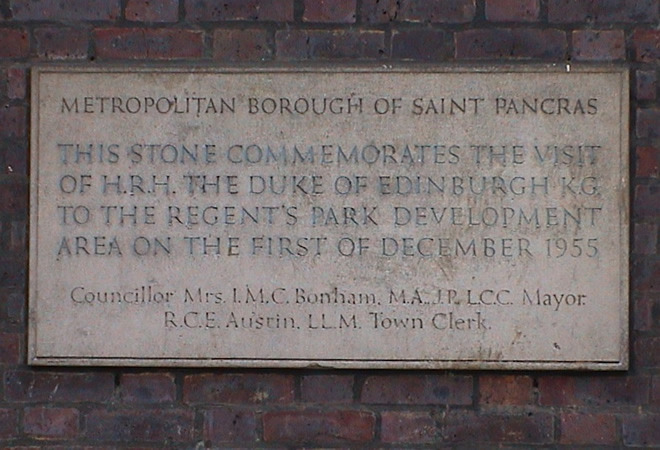 to the Regent's Park development area on the first of December 1955. Councillor Mrs I.M.C. Bonham M.A. J.P. L.C.C. Mayor., R.C.E. Austin L.L.M. Town Clerk. LLM, Town Clerk, active in the 1950s and 60s. Note the use of London Underground’s own typeface, Johnston Sans.